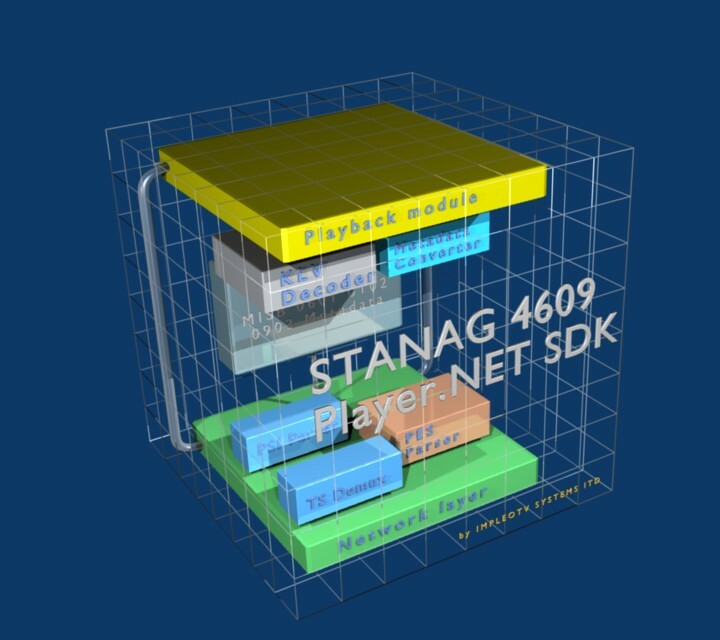 STANAG 4609 Player .NET SDK is an "ITAR-free" library that provides stream/file playback and MISB KLV extraction/decoding functionality. It helps developers to create applications that play back streaming video coming from UAV platforms and extract the telemetry metadata (MISB 0601.X, 0102.X, 0903.X). The SDK has a rich feature set that can be easily customized, providing a robust and a cost effective solution for any STANAG 4609 related development project. The applications built on top of ImpleoTV's STANAG 4609 Player .NET SDK are deployed into a variety of civilian and military applications worldwide. STANAG 4609 network stream (TS over UDP and TS over RTP) playback (configurable Nic/IP/Port). STANAG 4609 HLS (local files / http) playback. MPEG TS (MPEG2/H.264 payload + MISB 0601.X / 0102.X, 0903.3 (VMTI) metadata) support. Synchronized Raw (compressed / uncompressed (RGB, YUV, Grayscale)) video frames, KLV (raw buffer + decoded metadata) and private data callback. Frame accurate sync. VMTI (Video Moving Target Indicator and Track Metadata) MISB 0903.X support. MISB to JSON / GeoJSON decoding. Closed caption KLV extraction and transcoding.